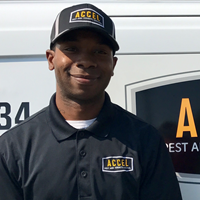 Accel Pest and Termite Control is a locally owned and operated company providing quality pest, termite, moisture control, and insulation services throughout all of Hampton Roads. The specialists at Accel have gained a reputation for their thorough work practices and as leaders in their field. When you have an issue, Accel is the solution. Easiest home improvement we’ve ever done. Great prices, professional. The technician Josh is very detailed oriented and leave no signs of pest unaddressed. Very impressed with everything. I called for an initial consultation and was scheduled shortly thereafter. Technician was prompt with arrival and explained in great detail how this company will surpass my family's service needs. I am a true believer. Thank you to all the friendly and courteous staff. Called, ACCEL responded immediately! Provided a two hour time window and honored the agreement! Agent was very professional, knowledgeable, polite. Prices were within reason! What else can one ask for? Staff is very friendly. They come when they say they're going to come. I have a yearly contract with them, so they come about four times a year. However, if I have a problem with insects at any time, they're very quick to stop by and help. I am very happy with Accel. They continue to get my ant problem to go away. Alex is an excellent customer representative and does everything to try and help and acccommodate me. She a valued employee ! Thank you very much. Dee Streeter. If you are looking around a pest control companies that is affordable, honest and knowledgeable-this is your place! I called around to several places yesterday & this company was so kind to me and made the whole process, one in which I have never had to deal with, very easy. They came out to inspect my house that day and suggested the more economical option to start with! I would 100% recommend them for anyone to use!! We had a nasty yellow jacket situation under my house. Initial meeting was prompt. Work performed in next day or two (we were just avoiding that part of the outside of our house, not in a huge rush, they could have come earlier). They arrived promptly, addressed the problem, billing was as discussed. I was told if I see bees in a day or two, call and they will provide another treatment at no additional charge. I saw a few bees, I called, they came the next day. All in all, a very hassle-free, professional experience. I will use then again. Sales manager, Pete, is very professional and courteous. Arrived on time. We had specific concerns with small pets in the house. He worked with us. Bugs are gone. Saw a few ants a week later. They came back, no questions asked, and now ants are gone. Their treatment worked, the price was reasonable, and the service was on time and their attitude is accommodating. Finally free of wasps, spiders, etc. I highly recommend doing business with this company. I had European Hornets on my roof that were getting into my attic & house along with a couple of yellow jacket nests outside. Pete Bryant came and gave my property a thorough inspection & estimate & Joshua Desper came & did the work. Both showed up on time, were very professional, courteous & knowledgeable. I would definitely use their services again. Very professional and got the job done! I am completely satisfied with my experience with Accel. The experience was better than I thought it would be. I do recommend others to use them. Accel Pest Control is a wonderful company to do business with. Pete came out and assessed our situation and was able to rectify the problem very quickly. I recommend them to anyone looking for speedy results!!! Mr. Bryant is very knowledgeable. Came to our home within three days, gave thorough assessment of situation with active subterranean termites (YIKES!!) and carpenter ants. Work was done three days from then. He left no traces of his visit, even though he had to drill into brick, heart pine flooring and sheetrock! Glad these guys are available. Accel is extremely accommodating, professional, and affordable. Excellent service! I went on line and scheduled appointment. It’s was quick and easy. The service is what I expected. The technician arrive when he said he would. Accel Termite and Pest Control did an outstanding job in performing termite inspection on my rental property. The serviceman was very professional and courteous. So far everything is good. It's only been a week. Maybe after a month, I'll be able to judge the effectiveness on the ants, spiders and other summer insects. Right now I'm satisfied with the job. The service was provided in a professional and timely manner. Service and results are excellent! We passed along the company's number to some friends that attended our event as they were very impressed as well. Josh did a very good job and was very professional and friendly. I like Accel Pest and Termite Control. They are very nice and quick to respond. We have loved our service so far and have already seen vast improvements! Fast, easy and affordable! Pete was super professional! Pete Bryant is ALWAYS reliable and on time. Exceptional Service. Last name is Bodette not Vodette. Courteous, patient, knowledgable, provided me with what I needed with affordable options from which to select. Service was prompt and as proposed. All around good experience. Pete was very knowledgeable and service is great and on time.